We offer you all our models to the sale of industrial paint booths (and Matt) for the treatment of surfaces. 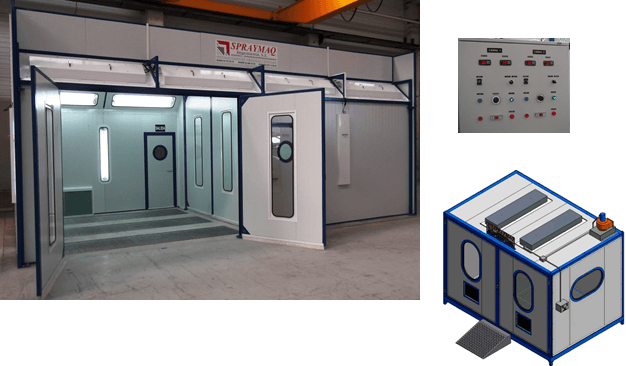 Enjoy best pressurized paint booths with the best quality at an affordable price. Also you recommend see our drying kilns! Tempered and pressurised painting booths. Walls and booths open for painted and varnished. Lower suction areas open for painting of large parts. Areas of sanding, Putty and preparation. 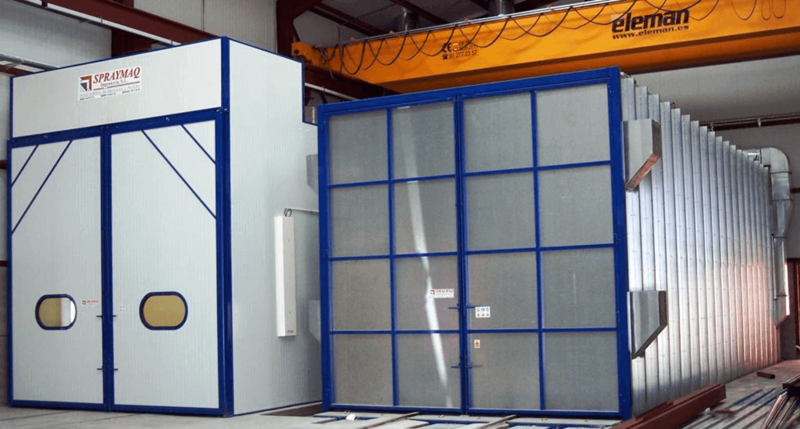 Pressurisation and conditioning of enclosures of painting kits. It is done using luminaires are fitted with watertight screens connecting outside, separate from the interior through a Crystal, located longitudinally in the upper corners of the roof in the form of chamfer, as well as the side walls in order to illuminate the bottom of the cabin. Its function is to introduce and build the inside of the enclosure, a dust-free and homogeneous temperature atmosphere. The air taken from outside is driven by centrifugal turbines, warming up when passing through a heat exchanger, diesel oil burner, or natural gas. willing pre-filters and high efficiency filters, It guarantees the cleanliness of the air introduced. Held by fans outside the vein of air-powered. Before going abroad through ducts or chimneys. The air is subjected to a double-stage filtration, for the retention of the pigments, in order to be able to comply with current legislation on emission of particles to the outside. Structure and enclosure, Lighting, Contribution groups air, with natural gas burners, diesel oil, or propane. Distribution plenum, Output filtering system, double-stage. Extraction fans, Helical, or centrifugal. Electrical panel, for the command and control of all components of the cabin. Cabins for varnishing of furniture and fine carpentry. 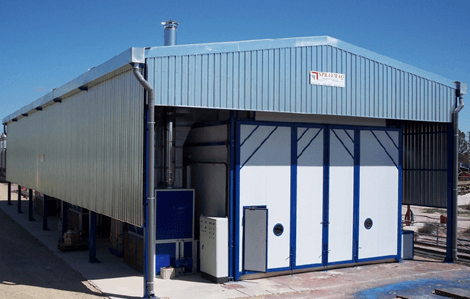 pressurized, in depression, Air tempered with baking position, with different types of ventilation, vertical, horizontal, optional system for drying varnish to water. In commercial profiles, by bolted joints. Sandwich cladding Panel filled with polyurethane foam or rock wool. Air distribution plenum, It is filtered and homogenises the flow of air to the cabin. Groups of supply with natural gas burners, diesel oil, or propane. Output filtering system. It is responsible for filtering the air before their evacuation to the outside, eliminating pigments and solids that may contain. This stale air filtration is performed by double stage filtering walls. With its corresponding fireplaces and extraction fans. In this section you will find all our cabins open for painting, decide which is which is best suited to your company and if you have any questions call us! We will offer you the best resources to paint in open area to the best price of sale! Walls and booths open, with dry filters, for stained or painted small parts. Different models: simple portable, Double, with active carbon. We plan according to your needs. Open with lower extraction areas, specially designed for painting large parts. Walls for painting and varnishing of small parts, in standard execution, or adapted to the needs of the customer. Open areas of painting, lower suction through moats. Recommended for painting of machinery and large metal boiler parts, allowing an open space, broad, comfortable and with good mobility of the parts, (directly with bridge crane), so you get optimal use of industrial space. They are equipped with axial fans, or centrifugal, bottom suction, through trenches covered with tramex trafficable, with double-stage filtration, for wet and dry pigments. They can be combined with aspiring walls. As you have seen, We have a wide range of facilities and cabins to paint. However, Spraymaq is not only that, but we also have of cabins and specialized facilities for each action. Specifically, You can find sandblast booths, cabins of metallic and filtration equipment.